Simply put, deer love sugar beets (Beta vulgaris). 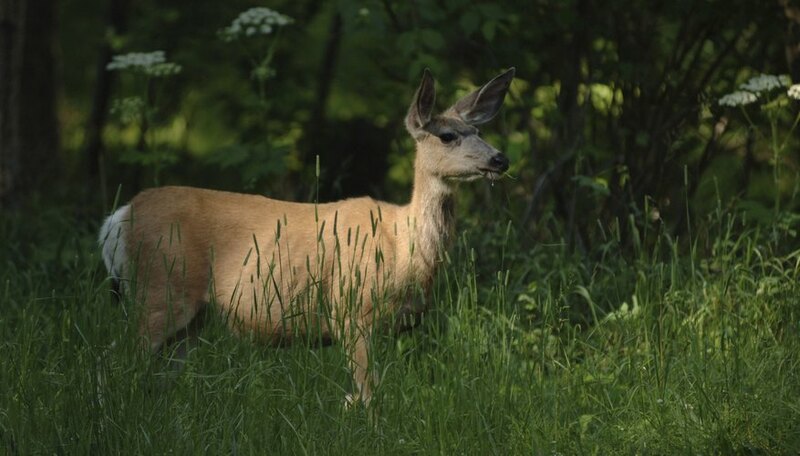 The plants' green tops provide a crunchy salad for populations of deer to munch upon while the sweet roots, according to a Heartland Outdoors article, are like deer candy. If you want to attract deer to your yard for hunting or even for pure enjoyment, you'll do well to plant a crop of sugar beets. Sugar beets are annual plants that grow in U.S. Department of Agriculture plant hardiness zones 2 through 10, making them a viable crop nearly everywhere in the United States. Put on waterproof gloves, and mix one part bleach with nine parts water in a bucket. Soak a clean rag in the solution, and use the rag to wipe a pitchfork and shovel. Allow the tools to dry. Turn over the soil with the pitchfork in the location where you want to plant sugar beets. Remove clumps of grass and other growth, or simply pull up all weeds while wearing garden gloves. Beets don't compete well with other vegetation. So it's important to clear the planting area to give them as much room as you can. Turn over the soil again with your pitchfork, aerating the soil and preparing it for planting. Shovel some soil to the sides of the planting area. That soil will be used to cover sugar beet seeds. Sprinkle sugar beet seeds over the planting area at a rate of about 8 to 10 pounds of seeds per 1 acre. One acre is 43,560 square feet. So if your plot is smaller, measure its area to find its square footage, and then plant an amount of seeds that is proportionate to that square footage. If you would use 10 pounds -- 160 ounces -- of seeds to cover 1 acre, which is 43,560 square feet, then you would use 1.6 ounces of seeds to cover a plot that is 435.6 square feet, 8/10 ounce of seeds for a plot that is 217.8 square feet and 4/10 ounce of seeds for a plot that is 108.9 square feet. Shovel the soil you reserved along the sides of your planting area, and sprinkle it lightly over the seeds. Ideally, the seeds will have no more than 3/4 inch of soil over them. Beet seeds don't necessarily need to be covered, but a soil layer can prevent birds from eating them. Water the newly planted area just enough to moisten the soil but not drench it. Continue to water the area lightly if it dries out during the few weeks after you planted. Pull up all weeds that pop up in the planted area. Removing the weeds prevents the beets from having to compete for space and sunlight.